Discrete mathematics is an essential tool in many areas of computer science. Problems in discrete mathematics arise in programming languages, computer architecture, networking, distributed systems, database systems, AI, theoretical computer science, and other areas. This up-to-date text assists undergraduates in mastering the ideas and mathematical language to address problems that arise in the field's many applications. It consists of 4 units of study: counting and listing, functions, decision trees and recursion, and basic concepts of graph theory. 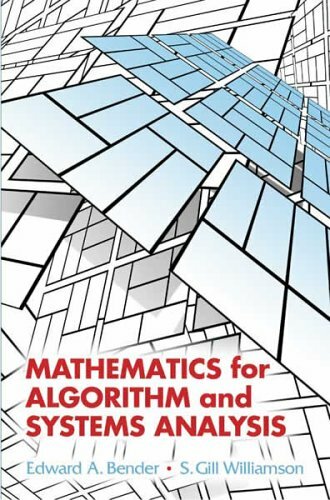 The main purpose of the book is to acquaint advanced undergraduate and graduate students in computer science, engineering and mathematics with the algorithmic ideas in computer algebra so that they could do research in computational algebra. A text on vector and matrix algebra from the viewpoint of computer graphics. It covers most vector and matrix topics needed for college-level computer graphics text books. Useful to computer science students interested in game programming. The authors offer a tutorial on the new mathematical ideas which underlie their research. Many of the ideas in this book will be accessible to a well-trained undergraduate with a good background in mathematics and computer science. The purpose of this book is to show how the computer can draw technically perfect pictures of Julia and Mandelbrot sets. All the necessary theory is explained and some words are said about how to put the things into a computer program.